What Are Swanky Swig Glasses? Sometimes, things sit in kitchen cabinets for so long, they gradually age into collectibles. If you have a few colorful character glasses stuck way back in one of your cubbies, it's time to get them out and look them over. It's time to learn about what makes a swig swanky. The predecessor to today's character glasses actually came about decades ago during the Depression era. 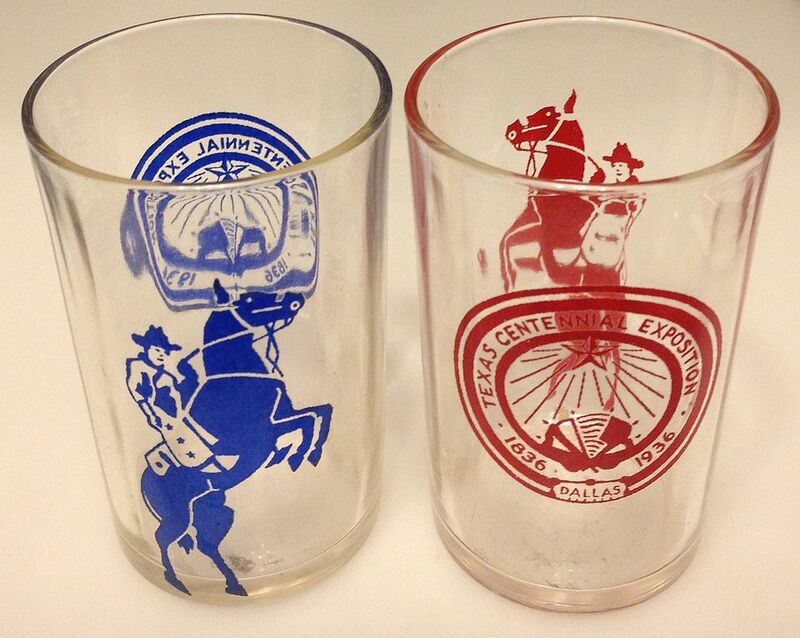 Collectors call these little glasses "swanky swigs" in reference to the fancy decals featuring flowers, stars, animals, and even Texas Centennial exposition themes. These juice-sized tumblers originally held Kraft spreadable cheese and were distributed as premiums (like a gift with purchase) over many years. Occasionally collectors will run across a swanky swig with an original lid bearing the Kraft name or with the cheese product still in the jar. Older glasses with a similar look originally held other types of products, and these are sometimes referred to as swanky swigs as well, but not usually by collecting purists. Swanky swigs distributed by Kraft measure 3 1/2" to 4" in height, while other similar glasses can vary in size. Lots of swanky swigs are still around since juice glasses tended to get less use than other sizes of drinking tumblers dating back as far as the era of Depression glass. Many of them are still in great shape, but running across a few with faded decals or discoloration from washing and wear is not out of the question. Those worn examples, of course, are worth far less than the unused ones. Of course, none of them are ultra expensive. Many different Swanky Swig examples can still be found for $10 or less, with the Texas Centennial tumblers usually selling for about twice that. Relatively inexpensive and fun to discover and display, these older decorated tumblers will continue to increase in value as we move further into the 21st century. Six scenes from the popular Howdy Doody Show held the first spot on a Welch's jelly jar back in 1953. These jars now sell for $75 or more each in excellent condition. Even more impressive, a limited-release prototype Howdy Doody jar can be worth a whopping $800 to the right individual. These were the first issues of premiums we know now as "character glasses" in the collecting realm. Another Welch's set important to collectors features the original Flintstones characters. These particular glasses can run in the $75 range, too. The Archies, Disney characters, Winnie-the-Pooh, Tom and Jerry, Dr. Seuss, and the Muppets have all had their cartoon likeness decaled on Welch's jelly glass jars over the years. All these characters find importance by appealing to children, and as those children mature into adults, the nostalgia factor intensifies that importance. All those grown-up kids begin collecting their long lost pals. Pepsi, McDonald's, and Coca-Cola have issued some of the most popular character glasses. Many of these can be found for $10 or less, but some rare examples sell for $100 or more in the right market. Back in the '70s, superheroes such as Superman and Aquaman found their way into homes through Pepsi promotions. Some Pepsi glasses can even be worth thousands. That's why it is important to research each glass individually when evaluating your garage sale and estate sale finds. McDonald's offered the Camp Snoopy collection a little later, but these glasses aren't worth nearly as much at less than $5 apiece. Other fast food tumblers in the low-end price range are Arby's BC Ice Age, Hardee's Smurfs, McDonald's Muppet Capers, and Pizza Hut's Flintstones Kids. All of these are examples of issues that were very popular, and many were saved as collectibles rather than used for drinking, so the price just hasn't gone up over the years.